Buckhead Dental Partners is dedicated to providing our clients with the best dental care possible. We invest in the most trusted tools and research the latest techniques in order to improve the quality of dental healthcare that we give. Our Atlanta dentist offers a wide array of services including cosmetic dentistry, tooth whitening, veneers and dental surgery. 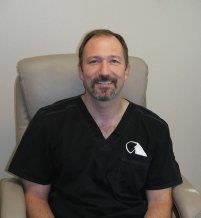 With more than seventeen years of dental experience, Dr. Jeffery Ballard, Atlanta cosmetic dentist, is the leader of our great team at Buckhead Dental Partners. Atlanta residents in search of a dependable and professional Buckhead dentist are invited to drop by at our office and experience top-quality dental care with a warm and caring touch. Many people put off regular visits to the dentist, often due to anxiety and fear. 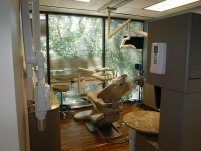 At Buckhead Dental Partners, the relaxing environment gives patients the utmost comfort and reassurance. Our dentists and hygienists take the time to explain each procedure and dispel any apprehensions. For those who request them, we also offer methods such as sedation dentistry to ensure your comfort throughout any major procedure. Our office is a conveniently located Buckhead dental facility that residents from the greater Atlanta area can enjoy. For your added convenience, our office also offers an online appointment request form so that you can schedule a visit from the comfort of your own home. Our well-trained and accommodating staff always offers a great experience each time you visit. Dental health education also plays a part in our philosophy. The value of teaching good oral health habits to children cannot be underestimated. Dr. Ballard, our Atlanta dentist, guarantees trustworthy consultations and patient education together with our team’s dental expertise. Every dentist procedure is done with a regard for patient comfort and convenience. At our office, you will find the perfect Buckhead dentist facility for you and your family. Here at Buckhead Dental Partners, we have a number of dental services that our staff are highly qualified to carry out. We’re trusted by our patients, and our testimonials are proof of that. Below is just a snapshot of some of the most popular services we offer. You may want to check out our service page for a more in depth look at how we can make your teeth look absolutely amazing. Everyone wants the perfect straight white smile, and our Atlanta cosmetic dentistry procedures can make that a reality for you. We think you’ll feel more confident, happy and attractive once you’ve finally gotten the set of teeth you deserve, and we have the skills to make it happen. Creating your ideal smile takes vision and expertise, so you shouldn’t trust the job to just anyone. Our renowned dentist, Dr. Jeffery Ballard, has nearly 30 years of experience in the cosmetic dentistry field, and is the perfect person to consult with to complete any of the cosmetic procedures that you want and need. It’s normal to have discolored teeth, cracks, uneven or misshapen teeth or cracked enamel. However, you don’t have to live with these issues once they occur. At Buckhead Dental Partners, we offer a number of specialized cosmetic procedures to resolve any issues you have, including veneers, tooth whitening, implants, bonding and dental bridges. Contact us for a consultation on cosmetic procedures today, and cure any embarrassment or issue that your teeth have been plaguing you with! It’s always nice for a whole family to attend the same trusted dentist, but unfortunately not many offices offer care for all ages. Luckily, at Buckhead Dental Partners we cater to every need, from those of the smallest child to the most elderly of people. We know going to the dentist can be overwhelming, or even scary, for some children. We know how to solve these issues. Our dental office is comfortable and welcoming. Better yet, you’ll find our team to be kind and friendly, so any little nerves will be cared for sensitively. By visiting us on a regular basis, your child will come to realize that their relationship with their dentist is one built on care and trust, so there’s absolutely nothing to fear. We also recognize the importance of educating our patients about proper dental care, so you can expect to take home some advice on how to better care for your teeth. This way, you can continue maintaining healthy habits at home. Extractions have a bad reputation, as many people consider them painful and stressful. However, this just doesn’t need to be the case. By trusting your mouth to a reputable dental professional, you can ensure your tooth extraction goes as smoothly as possible. It’s extremely uncomfortable to have pain in your tooth. While some dental issues can be resolved through other treatment methods, sometimes, the only answer is an extraction. In the event of an extraction being required, we’ll ensure you’re educated about the procedure to ease your worries. Cavities can be a real problem for some people, and it’s not always through fault of their own. Fortunately, fillings are there to resolve these issues. Fillings are the synthetic material placed inside the empty space to prevent the cavity from decaying further. Fillings can be made from various different materials, including gold, amalgam or composite tooth colored material. Your dentist will discuss which material is right for you, depending on your needs and preferences. If you’re in need of a filling, our staff will be on hand to help the procedure go smoothly. We understand that everyone has opinions, feelings and preferences on their oral procedures, so we’ll work with you to make sure everything goes according to set expectations. As the saying goes, “An ounce of prevention is wortha pound of cure”, so we’ll always be there to give you advice on how to prevent decay and fillings in the future. One of the youngest graduates of the 1998 Dental course at the Medical College of Georgia, Dr. Jeffery Ballard is a professional you can happily trust your teeth with. He’s a member of the American Dental Association, Georgia Dental Association, American Academy of Implant Dentistry, Academy of General Dentistry, and American Academy of Cosmetic Dentistry, so you know you’re making an appointment with a highly qualified, trusted and reputable dentist. At Buckhead Dental Partners, we discuss your concerns and worries with you, so you’re put at ease and know what to expect before, during, and after the procedure. If you have any preferences on how the procedure is carried out, such as pain relief, we’ll talk these through with you and do our best to accommodate your wishes. Patient care is extremely important to us, which is why we focus so much on building a good relationship with our patients. We can take care of you while you’re with us, but once you leave our doors you need to know how to care for your teeth, too. That’s why we always focus on educating and informing our patients about their oral health. We will answer any questions you may have about your teeth, as well as offer you helpful advice and tips on oral hygiene. Whether you need help keeping to a healthy diet, teeth cleaning advice or want more information about a procedure, we’re the ones to help you. One thing’s for sure–we want you to come back with a healthy smile on your face! 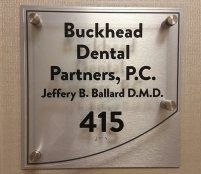 We’re excited to announce that Buckhead Dental Partners has moved to a new and improved location! You can now find our offices at 3525 Piedmont Road, Bldg #8, Suite 415 Atlanta, Georgia 30305. If you need any help in finding our new dental practice, don’t hesitate to call us for some extra directions. Our kind and friendly staff will be only too happy to point you to the right place. Are you ready to start taking proper care of your teeth? It’s time to contact us to make an appointment with our dental team! You can call us at 404-261-0610, email us at admin@buckheaddentalpartners.com or even send us a message through our website. Alternatively, we’d love for you to make an appointment and visit us in person at our new location. We’re open from 7am to 4pm Monday to Friday, so even those who work during the week, can make an early morning appointment with us. If you’d like any more information, advice or guidance, please contact us so that we can answer any questions or concerns you may have. We, at Buckhead Dental Partners, look forward to hearing from you! Please make a note of our new practice address.